As more and more people become health-conscious in an age where obesity is near the norm, there is at least one healthy alternative to fried food cooked with oil. The good news is you don’t have to give up that fried food in order to drastically cut calories and cholesterol. You also don’t have to hover over the frying and you won’t get any oil burns. Our oil-less fryer reviews aim to help you pick the right airfryer for your needs. The oil-less fryer is becoming quite popular, and it’s a really great way to get the fried food taste without using oil, or at least very little of it. In fact, many think of it as a deep fryer without oil. For those of you who are on a diet or concerned about heart health, you can have some of your favorite fried foods, particularly frozen foods, without all the additional calories of oil. Some of the features of these fryers include dishwasher safe parts, adjustable digital temperature settings, digital timers, technology that cooks food to become crispy, a closed cooking system that is odor-free, and they are multi-functional (meaning they will cook different foods in different ways). Each of the different fryers will have different features, so it’s important to examine each of the available models and see what the differences are. You should ideally look for how much food the fryer can accommodate and how much space it will take on your countertop. Also look at wattage which typically ranges from 1000W to 1500W. The oil free deep fryer is available online and in stores, so feel free to compare prices. With so many on the market, we thought we would provide you with a few reviews of air fryers here and let you know what some other people have been thinking about cooking with very little oil as well. Keep in mind that the end result won’t be exactly like what you get from deep frying, and battered fish or chicken made from scratch at home is almost impossible. If that’s what you’re looking for, here are some good deep fryers for home use. If you want an air fryer that’s more versatile, there are some new fancy models that are slowly appearing in the market now, like this Gourmia GTA2500 airfryer that can also roast, steam and bake foods. However, there are some very highly rated models that lie somewhere in between, as you’ll see if you read further. 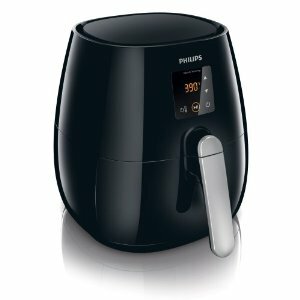 When it comes to air fryers, the Philips HD9230/26 Digital AirFryer is hard to beat. Heated air is propelled at extremely fast rates through the cooker, and food is fried to a deep golden brown, just like regular fried food. The unique starfish design at the bottom ensures even cooking and excess fat from meats is allowed to drain away while cooking. This appliance can be used to fry, grill, bake, and roast food using just a tablespoon of oil. It includes a double layer rack, so you can cook a decent amount of food in one batch. It has a digital touchscreen interface that makes it very easy to use. You can set the temperature up to 360 degrees F and also the timer up to 60 minutes. It will alert you when done and it is equipped to auto shut off for safety. It has a 1.8 pound capacity and is good for a family of up to three. Its wattage is 1425W. Additional features include cool touch hand grips on the fryer, internal cord storage, and a recipe book. There is even an app by Phillips that can guide you to getting the best out of your fryer. You can use any of your own oven-proof dishes in this fryer. It has been described as great value, with easy cleanup because of its dishwasher-safe components and is attractive in the kitchen. There are a few optional accessories that you can buy with it, including a double grill rack with skewers, a baking pan, and a grilling pan. This may increase the overall cost of the unit, but you can do so much more with it if you get the accessories. Its dimensions are 14.5″ wide x 14″ long x 14.5″ high and is available in black or white. The Living Basix LB200 Jet-fry Fryer has features that include a revolutionary new convection/infrared technology for evenly frying food without using much fat or oil, a digital programmable timer, temperature controls with a digital thermostat, and is multi-functional (will grill, bake, or fry). This appliance cleans up easily and the fry bowl is non-stick, although it is not meant for the dishwasher. With a capacity of 2.5 litres, it is a compact unit, measuring 11.5 x 12.8 x 13 inches and features retractable cord storage. Its power is 1400W, the maximum temperature you can set is 400F and the timer can be set for up to 30 minutes. Most people who reviewed this appliance pointed out the fact that it is an easy-to-use counter-top appliance, and it really does deliver when it comes to creating fried food that has that deep-fried food taste. There were no complaints about this particular model, and people found it was moderately priced, and definitely a good value. The De’Longhi FH1163 MultiFry not only fries food using less oil, but can also bake anything from a cake to a pizza, simmer sauces, broil a steak and much more. It uses an innovative Surround Cooking System technology that makes use of two heating elements and a stirring paddle for uniform distribution of hot air to cook food fast and evenly. The top heating element is rated at 1200 watts and the bottom one at 200 watts. You can select from 4 power levels and set an audible timer, depending on what you’re cooking. Its cooking bowl is ceramic coated and has a 3.3 lb capacity for a cake without using the paddle but a bit lower for foods that require the paddle to be fitted. So you can cook up to 8 servings of fresh or frozen fries using just a tablespoon of oil for the fresh or no oil for the frozen. The removable lid is transparent so you can monitor everything till cooking is done. Its dimensions are 15.6 x 12.8 x 10.6 inches. An included recipe book will help you make delicious dishes before you experiment and try out your own. All the removable parts are dishwasher-safe. The T-fal FZ7002 ActiFry only uses 1 tablespoon of oil to cook 2 pounds of french fries and other dishes like stir fries, risotto, chicken and more. It comes with a paddle that mixes food around as it cooks in a ceramic coated nonstick pan, and a pulse heat system makes sure the oil coats every bit of food. It is not exactly a complete substitute for a deep fryer as it is more of a cross between a convection oven and a skillet, but you can make food pretty crisp. It has been mentioned that this model is one of Oprah’s favorite things and it is a good choice if you want something more versatile than just an appliance for fried, baked or grilled foods. It does not need preheating. Featuring an easy 2 button operation, it has a buzzer that goes off when the digital timer is done. It has a 32 ounce capacity, so you can make sure to get those big meals cooked on time. It uses 1450 Watts of power, which makes it one of the bigger and more powerful units. The pan, paddle and drainage filter are all dishwasher safe and the unit comes with a recipe book. It measures 16.7 by 13.6 by 9.4 inches. As far as drawbacks are concerned, you may have to look out for the paddle getting stuck some of the time. The Avalon Bay AB-Airfryer is an amazing appliance for a very good price. This appliance boasts a 3.2 Litre non-stick mesh food cooking basket, a stainless steel heating element, completely dishwasher safe parts for easy cleaning, and rapid air circulation technology which quickly fries your food. This is the same technology that the Phillips fryer uses so you can fry, bake, grill or roast food, but by keeping your settings and features simple with the use of manual dials, it costs much less. You can choose from 4 preset temperatures that range from 200-400F, and for safety there is a 30 minute timer that you can set in 5 minute increments and it comes with auto shut off. For more even cooking, it’s recommended that you pause the process in the middle to remove the basket to shake the ingredients and then put it back to finish cooking. The cooking resumes automatically when you close the lid and the timer starts from where it had stopped. This unit measures 13.5 x 11 x 12.8 inches and is available in white, black or red. It draws a power of 1500 watts. People who reviewed it found that they were not disappointed and the food that they cooked came out great and was delicious. It has been described as very easy to use. The instruction manual is very detailed. Most people find that it was easy to clean although you must be careful if you hand wash the basket as it has a non-stick coating. Some say that it does not get overly hot, which makes it safe for pets and children to be around while operating. The BIG BOSS 1300 Watt Oil-Less Fryer uses a combination of three different ways to cook the food at once: halogen to heat food surface for browning, convection for even cooking by hot air circulation, and infrared for making sure the inside of foods is fully cooked. The unit comes with an extender ring to allow you to cook even a turkey, a spray bottle to lightly coat the food with oil and two trays that maximize your cooking surface. It has a tight seal glass lid with timer controls over a large glass bowl that you place the trays in, and all these components are easily cleaned. Frozen food cooks very quickly and there’s no need to thaw them first. This unit is energy-efficient at 1300 watts, cooks quickly, and does not use a lot of electricity. People generally love the BIG BOSS, and it’s good for families because it is a larger unit at 16 quarts and cooks more food in a single batch. Keep in mind that it is a big appliance so it’s not practical for small kitchens. The price is lower than most of the other oil free cooking appliances available on the general market. Overall, it’s good value but know that the halogen lamp glows very brightly when the unit is on. Some users also say that you have to increase the times specified in the manual by a few minutes for anything to be fully cooked, and some foods turned out a bit dry. This can be overcome by adding a little bit more oil with the spray bottle than recommended in the manual. So if you’re a health-conscious consumer, and you are really interested in losing weight or cooking for a healthy heart, you will definitely be at an advantage if you chose one of the 2016 oil-free fryers that let you cook with very little oil. Don’t expect the results to be exactly like those from traditional deep frying, but it is a good and tasty alternative. I fried chicken in my big boss and they came out crispy the suggested cook time was incorrect I had to double the cook time and flip the chicken. Nice meal I had this evening.